The Novgorod Republic or Novgorodian Rus' (Russian: Новгоро́дская респу́блика, tr. Novgorodskaya respublika, IPA: [nəvgɐˈrotskəjə rʲɪsˈpublʲɪkə]; Новгородскаѧ землѧ / Novgorodskaję zemlę, Novgorod land; Latin: Novogardie or Russian: Новгородская Русь, tr. Novgorodskaya Rusĭ) was a medieval East Slavic state from the 12th to 15th centuries, stretching from the Baltic Sea to the northern Ural Mountains, including the city of Novgorod and the Lake Ladoga regions of modern Russia. Citizens referred to their city-state as "His Majesty (or Sovereign) Lord Novgorod the Great" (Gosudař Gospodin Velikij Novgorod), or more often as "Lord Novgorod the Great" (Gospodin Velikij Novgorod). The Republic prospered as the easternmost port of the Hanseatic League and its Slavic, Baltic and Finnic people were much influenced by the culture of the Viking-Varangians and Byzantine people. In the middle of the 9th century Novgorod was a name used to describe viking staging posts on the trade route from the Baltic Sea to the Byzantine Empire. There is a theory that in fact it was not Novgorod as misinterpreted by later chroniclers (as stated by dendrochronology, Novgorod was founded only in the middle of X century), but Nevo Gardas - viking settlements on Lake Ladoga, as in one of Nestor's chronicles from the 12th century he mentions a lake called "the Great Nevo", a clear link to the Neva River and, possibly furthermore, to Finnish nevo "sea" or neva "bog, quagmire". Novgorod was populated by various Slavic, Finnic and Baltic tribes that were constantly at war with one another for supremacy. However, these tribes came together during the beginning of the 9th century to try and form a negotiated settlement to end military aggression between each other. The Novgorod First Chronicle, a collection of writings depicting the history of Novgorod from 1016-1471, states that these tribes wanted to “Seek a prince who may rule over us and judge us according to law.” By transforming its governing institutions, Novgorod rejected its politically dependent relationship to Kiev. In 882, Prince Oleg founded the Kievan Rus', of which Novgorod was a part from then until 1019-1020. Novgorod Princes were appointed by the Grand Prince of Kiev (usually one of the elder sons). Cities such as Staraya Russa, Staraya Ladoga, Torzhok, and Oreshek were part of the Novgorodian Land. According to some accounts, a vicar of the archbishop ran the city of Staraya Ladoga in the 13th century. The city of Pskov, initially part of the Novgorodian Land, had de facto independence from at least the 13th century after joining the Hanseatic League. Several princes such as Dovmont (ca 1240-1299) and Vsevolod Mstislavich (before 1117-1138) reigned in Pskov without any deference to or consultation with the prince or other officials in Novgorod. 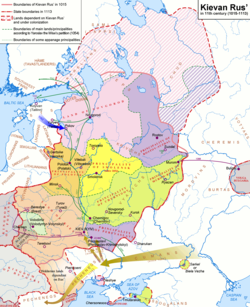 Pskov's independence was acknowledged by the Treaty of Bolotovo in 1348 (see Pskov Republic). Even after this, however, the Archbishop of Novgorod headed the church in Pskov and kept the title "Archbishop of Novgorod the Great and Pskov" until 1589. Novgordian Rus' and its inhabitants were much influenced by Vikings culture and people. 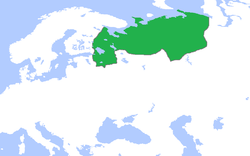 These cultural and ethnic Scandinavian imprint shaped later the society of Muscovite Rus' and whole Russia. Novgorod within Kievan Rus' prior to independence. Resisting the Muscovite oppression, the government of Novgorod sought an alliance with Poland-Lithuania. 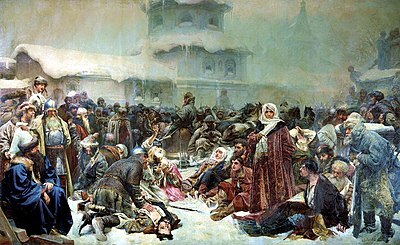 Most Novgorodian boyars wished to maintain the Republic's independence since if Novgorod were to be conquered, the boyars' wealth would flow to the grand prince and his Muscovite boyars and the Novgorodians would fall into decline. Most of them didn't earn enough to pay for war. According to tradition, the proponent of an alliance with Poland-Lithuania to save the Republic, called the Lithuanian party, was led by Marfa Boretskaya, the wife of Posadnik Isak Boretskii. ^ "Новгородская Русь. Единый учебник истории России с древних времен до 1917 года. С предисловием Николая Старикова". history.wikireading.ru. Retrieved 2019-02-14. ^ Evgeny Pospelov: Geographical names of the world. Toponymic dictionary. Second edition. Astrel, Moscow 2001, p. 106 f.
^ a b RBTH, Elena Potapova (2015-03-11). "On the trail of the Vikings in Veliky Novgorod". www.rbth.com. Retrieved 2018-12-18. ^ "Vikings in Russia history". community.dur.ac.uk. Retrieved 2018-12-18. ^ Karl Marx and Friedrich Engels, The Communist Manifesto. ^ a b c Valentin Yanin "Outline of history of medieval Novgorod. ^ Valentin Yanin "Sources of Novgorod statehood. ^ Viktor Nikitich Lazarev, Gerolʹd Ivanovich Vzdornov, and Nancy McDarby, The Russian Icon: From Its Origins to the Sixteenth Century (Collegeville, MN: Liturgical, 1997), 47. Veche was a popular assembly in medieval Slavic countries. The St. George's (Yuriev) Monastery is usually cited as Russia's oldest monastery. It stands in 5 kilometers south of Novgorod on the left bank of the Volkhov River near where it flows out of Lake Ilmen. The monastery used to be the most important in the medieval Novgorod Republic. It is part of the World Heritage Site named Historic Monuments of Novgorod and Surroundings. Evfimy II, Archbishop of Novgorod the Great and Pskov from 1429 to 1458, was one of the most prolific patrons of the arts and architecture of all the Novgorodian archbishops. According to the traditional scholarship, the veche was the highest legislative and judicial authority in Veliky Novgorod until 1478, when the Novgorod Republic was brought under the direct control of the Grand Duke of Moscow, Ivan III.